I know it's been a little while since I've posted, but in my defense, the holidays kept me quite busy, more specifically, baking. I'm tickled at the idea of how some people think that one or two days of holiday feasting result in weight gain. I laugh it off because most of the time, it feels like we've gain 5...10..or even 100lbs through one sitting. If this idea were even true, I think we all would be in big trouble. But the truth of the matter is that weight gain results in a surplus of calories over time. What we perceive to be weight gain after a holi "day" feast, is nothing more than an illusion of fluid retention, which is the direct result of food made with large amounts of salts, carbs, starches, etc. Our bodies naturally retain fluid in the presence of excess salt and "carbo"hydrates. The body naturally requires more fluid when processing larger amounts of carbs and salts. To get a fair estimate of measuring your weight after the holidays, do so 2-3 days after your feast. What I usually do, especially if I know I might be tempted to overstay my welcome at the holiday table, is to get in a good workout just before the feasting begins, thereby illuminating any unwanted extra calories. Since my workouts are usually intense, I just add another dimension to the workout. By hitting the track or gym as soon as a get up, my body is already in a energy depleted state, I increase my metabolism and need for energy, maximizing my calorie burning potential throughout the day. Since I am a seasoned fitness enthusiast, I know my limits, when working out in this way. 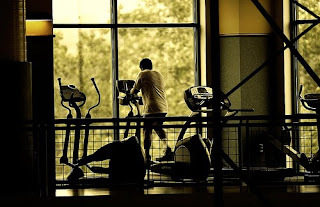 If you are a beginner, please exercise caution, because working out too intensely without eating, can make you sick. I recommend working out before you feast, why? Because it will give you more time to spend with family, friends, and the like and it ensures that you actually workout. Since many of us don't want to be bothered after we have had more than our "fill." Until next time, please have a safe and happy New Year. I have to profess that I am a sushi lover and as a self proclaimed chef, I have an affinity for developing new culinary skills. I decide to attempt sushi making for the experience, skills, and better understanding of the sushi-making experience. When I did my research, I found different thoughts on how to prepare sushi rice and its preparation alone is said to be art. I found out that sushi rice is suppose to be "sticky," but not "mushy." 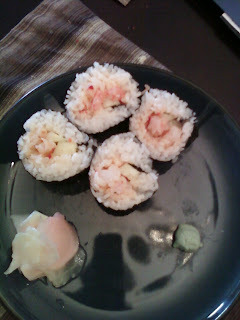 The Japanese use a short grain white rice to make sushi, but I made my rice with a medium grain rice that was sufficient. I washed the rice thoroughly until the water was almost clear. This technique is necessary to remove talc that is added to rice when processed to prolong shelf life and prevent spoilage. I allowed the rice to dry for about i hour and then I transferred the rice to my heavy bottom skillet added 3 cups of rice and 3 1/4 cups of cold water and let that come to a boil. I then turned the heat to simmer and cooked the rice for 20 minutes, after which I turned the rice off and let it steam for 10 minutes longer. Steaming rice is crucial because the rice is still cooking and absorbing moisture. While the rice was steaming, I prepared "tezu" or sushi vinegar, to add flavor to rice after cooking. It is made by taking rice vinegar, sugar, and salt and boiling them in a pot until the sugar is dissolved. When the rice was done I transferred it to a large bowl. I took a large wooden spatula and evenly distributed the tezu over the rice, then I carefully mixed the rice with the tezu, taking care not to pressed down on the rice, which could create mushy rice. I then took a piece of card board and fanned the rice to accelerate the cooling process. When the rice was about "body" temperature, I had to test whether or not I prepared it right. I took a small amount and pressed it together in my palm. It was extremely sticky, but not mushy, which is what I wanted. Happy, I proceeded to the filling. I created a spicy shrimp roll using diced shrimped that I blanched for a 2-3 minutes and a added to a mixture of garlic chili sauce and mayonnaise. Then I took nori (seaweed wrapper) and rolled the rice with the filling making a maki style roll. This is the resulting roll from the technique I used. It had nice flavor, heat, and I figured it was pretty good for a first attempt. Practice makes perfect meaning that I will be making a lot of sushi. 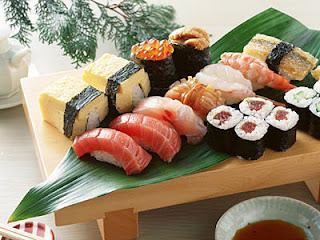 Sushi is extremely versatile and its ingredients are limited only by our imaginations. The fact that sushi is a healthy addition to an healthy and active lifestyle makes preparing it that much more satisfying. On most mornings, I usually have a "few" cups of coffee and a nice hearty bowl of oatmeal. I'm not talking about that "instant" garbage, loaded with sugar and artificial flavorings, no, I'm talking about real oatmeal. "Old fashioned," is the kind you slow cook on the stove or in the microwave (set on 50% power). Oatmeal in my opinion, is the best way to start your day. It's loaded with a host of health benefits and it's complex carbohydrate content wort off any feeling of sluggishness created by our poor selections of sugar laden breakfast alternatives (Trix anyone?) and provided you are not loading your oatmeal up with tons of sugar and butter. Oatmeal is most noted for is cholesterol lowering capabilities due to it's soluble fiber content and it helps to regulate digestion with it's insoluble fiber content. The best thing about oatmeal is its versatility. There are endless ways to dress up oatmeal, anything from fruit (fresh, frozen, or dried), to nuts (and nut butters). You can add flavoring such as vanilla, almond, and orange extract, zests, and spices like cinnamon, allspice or cardamom. My favorite combination currently is oatmeal prepared with vanilla soy, cinnamon, allspice, ginger, and splenda (for sweetness), finished with a dollop of peanut butter. 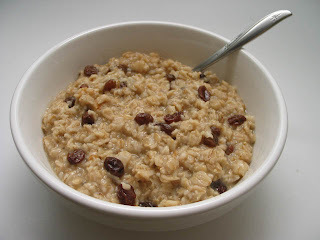 I use oatmeal as a precursor to my workouts: it breaks-the-fast, "breakfast" of at least 8 hours of sleep and provides the slow-released energy to power me through my workouts. Oatmeal also contains muscle building proteins and healthy (unsaturated)fats. My suggestion for anyone making a healthy lifestyle change, to start with breakfast and more importantly start with "oatmeal." Start Cooking for Better Health. As a fitness enthusiast and chef, I have a unique understanding of exercise and food science, giving me the ability to understand how food effects my body so that I can maximize my fitness goals. A change to a healthy lifestyle takes time, patience, discipline, and desire. I say desire, because you must first have a desire to recognize that change is necessary and have the belief that change is possible. Understanding that change doesn't happen overnight is also an important factor. Many of us have never stepped into a gym and have spent most of our lives routinely enjoying the foods that are in no way good for us. For me food and fitness go hand in hand. I call it the body builder's life style, because I one point in time, I was training (and eating), to compete. This lifestyle scrutinizes food in unbelievable ways, like calorie counting. Now I know calorie counting may be considered too extreme for most, but in the end, the discipline leads to great results. Changing to a healthy lifestyle, starts with cooking at home. I prepare about 98% of all my meals at home and I rarely eat out. Cooking gives me the greatest control over what goes in my food. Many of us eat out way too often and what's out there, is usually not the best for us. I like the idea that many restaurants and eateries are listing their nutrition guides giving us a better idea of whats in their food, but more importantly giving us the ability to make more health conscious decisions. Do you have to be a chef in order to cook at home? Of course not, anyone can learn to cook, it just takes the desire and willingness to learn. I can't tell you how many oppositions I get to cooking more at home. Any thing from, "I don't have time" to "I'm just too tired from work." I just simply retort, that "opportunity costs" When you are making a change, there is an "opportunity," but there is also a "cost." It's an economic principle that simply states, you give up something, in order to gain something else." In this case you "give up" eating out 50% of the time to "gain" cooking at home (and better health) for 50% of the time. Did I always cook, of course not. It was a philosophy that I adopted out of a need. I needed to yield better results from my workouts and so cooking gave me more control. It took time to adopt this philosophy, but once I was doing it, it became second nature. I urge anyone reading this post to give it a try. If you are someone that is eating out more than you are cooking, start with exchanging one day of eating out a week for a day of cooking at home. Understand that change takes time, but if you are willing and dedicated, then you are one your way to better health. So I am anticipating a decent workout today since I had an unscheduled rest day that was forced on me by my body. Delayed muscle soreness can be a great pain, because it's, well, delayed. Which basically means that the effects of a workout aren't felt to much later, usually a day or two after working out a particular or group of muscles. It's an inconvenience for me because, I'm always geared up for a nice workout and I didn't plan on resting yesterday. Although "resting" is greatly important to any exercise program, routine causes much stubbornness. My opinion to the anyone reading this post is to rest. Rest is important to the body's ability to repair, grow, and optimize itself. Just a tip for you. If someone were to ask me whats the greatest challenge with starting a fitness regimen, I would say clearly defining fitness goals. When I trained (for a brief period), I found out two things: the client didn't have goals that where clearly defined or the client had unrealistic goals. If you are going to start a fitness regime, you have to determine what it is that you are trying to achieve. You must also keep in mind that your goal development be realistic as it pertains to your level. If your goals are unrealistic, then creates a challenge for you achieving those goals. For example if your goal is weight loss and you are trying to loose 25 pounds in 2 weeks, that's very unrealistic, especially since a healthy fat loss regimen only allows for 2-3 pounds fat loss per week. By the same token if your over all fitness goal is muscle gain and you are just starting out, lifting heavy weight could result in injury. I often find that most people have better degree of success and motivation, when they are reaching their goals, goals that they have clearly and realistically defined.